The Graham Foundation is pleased to present The Master and Form, a new installation and performance series by artist Brendan Fernandes that explores themes of mastery and discipline within the culture of ballet through the use of designed objects that enable dancers to perfect and extend iconic positions. Through his residency at the Graham Foundation, artist Brendan Fernandes worked with the architecture and design collective Norman Kelley to develop a series of sculptural devices that serve as sites for intense, endurance-based practice. In contrast to the grace and apparent ease of ballet as seen on stage, the project seeks to investigate the nature of the discipline’s idealized poses, acknowledging the rigorous training necessary to achieve these shapes. In rehearsals and performances throughout the run of the exhibition, Fernandes assumes the role of ballet master and directs dancers from the Joffrey Academy of Dance as they perform with and within these structures, pushing closer to ideal forms on the edge of their physical abilities. While the sculptural objects and suspended ropes act as supports for the dancers’ bodies as they strive for ever longer extension and lengthy holds within each pose, the open scaffolding system provides a space for counter stretches, self-care, and physical and psychological release. The choreography—in which the master is both present but physically absent—seeks to queer the space of ballet, exploring the perverse pleasure of sacrifice in the name of form. 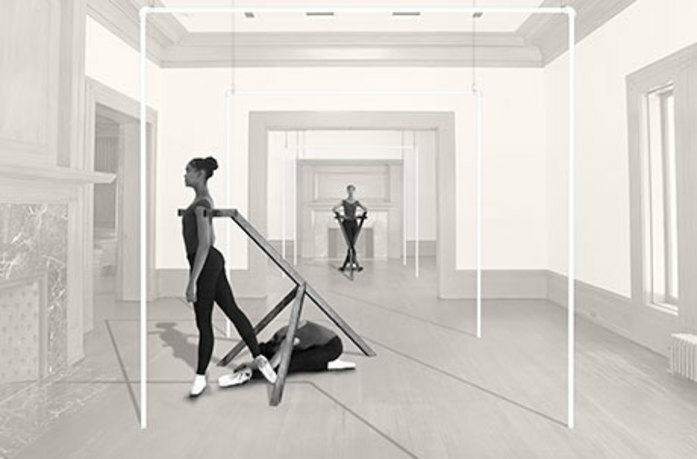 Occupying the first and second floor galleries, the installation gives audience members an intimate vantage point as dancers periodically move through variations on daily barre work that alternates between five fixed training objects and room-scale environmental interventions. Shaped by the lines and proportions of the dancers, the installation repeats and draws out the Madlener House’s existing architectural elements that relate closely to the body—such as thresholds and windows—creating an acute awareness of the body moving through space for both dancers and spectators alike. 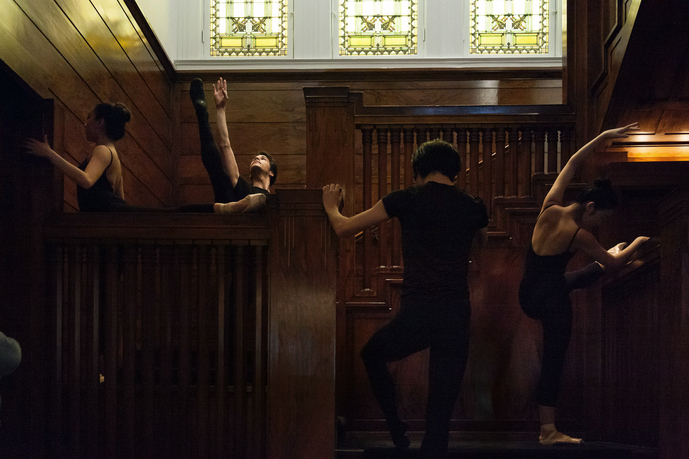 The Graham Foundation performance residency program invites practitioners working in a wide range of disciplines to expand architectural discourse and work directly with the physical spaces of the Foundation’s historic Madlener House. Now on its second year, Fernandes’ project follows Chicago-based ATOM-r’s development and presentation of Kjell Theøry during the fall of 2016. Brendan Fernandes is a Chicago-based Canadian artist of Kenyan and Indian descent. He completed the Independent Study Program of the Whitney Museum of American Art (2007) and earned his MFA from the University of Western Ontario (2005) and his BFA from York University in Canada (2002). Fernandes has exhibited widely domestically and abroad, including exhibitions at the Solomon R. Guggenheim Museum, New York; Museum of Modern Art, New York; Museum of Art and Design, New York; Musée d'art contemporain de Montréal; The National Gallery of Canada, Ontario; The Brooklyn Museum, New York; The Studio Museum in Harlem, New York; Mass MoCA, North Adams, MA: The Andy Warhol Museum, Pittsburgh, PA; Deutsche Guggenheim, Berlin; Bergen Kunsthall, Norway; Stedelijk Museum, Amsterdam; The Sculpture Center, New York; The Quebec City Biennial; and the Third Guangzhou Triennial in China. Additionally, Fernandes has been awarded many highly regarded residencies around the world. Recent exhibitions include Lost Bodies, which originated at Agnes Etherington Art Centre, Queen’s University, Ontario (2016) and traveled to the Textile Museum of Canada, Toronto (2017); and Free Fall, which originated at Monique Meloche Gallery, Chicago (2017), and resulted in an expanded version of the performance, Free Fall 49, at the J. Paul Getty Museum, Los Angeles in summer 2017. His recent monograph Still Move, was published by Black Dog Press, London, fall 2016. Upcoming solo projects include The High Line, New York (summer 2018), and DePaul University Art Museum (fall 2018). He is currently artist-in-residence and faculty at Northwestern University in the Department of Art Theory and Practice, and is represented by Monique Meloche Gallery, Chicago. Norman Kelley, a New York and Chicago-based architecture and design collaborative, was founded by Carrie Norman and Thomas Kelley in 2012. Norman Kelley’s work seeks to explore architecture and design’s limits between two- and three-dimensions. Along this spectrum, their work re-examines architecture and design’s relationship to vision, prompting its observers to see nuance in the familiar. The practice has contributed work to the 14th Venice Architecture Biennial (2014) and the first and second Chicago Architecture Biennials (2015, 2017), in addition to being the recipients of the United States Artist’s Architecture and Design Fellowship (2018), and the Architecture League of New York Young Architect’s Prize (2014) . Their collection of American Windsor chairs is currently represented by Volume Gallery in Chicago. The Graham Foundation gratefully thanks and acknowledges Brendan Fernandes and our collaborators on this project including Norman Kelley, the Joffrey Academy of Dance, and Monique Meloche Gallery; the contributions of Alex Inglizian, Jason Lewis Furniture, Navillus Woodworks, and Karsten Osterby; and the support of Crystal Head Vodka. 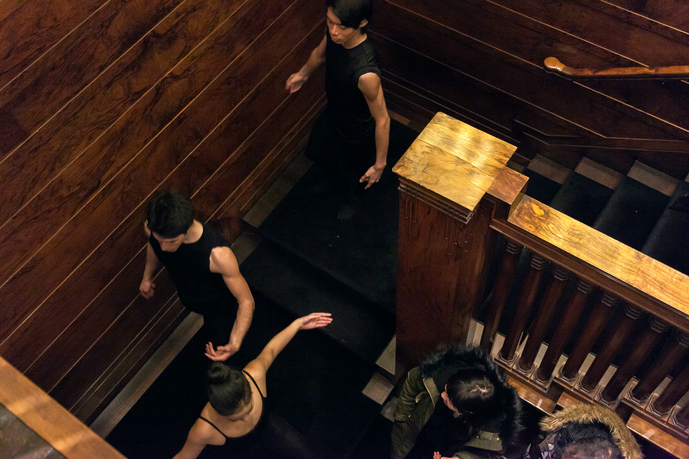 Special thanks to dancers Satoru Iwasaki, Yuha Kamoto, Andrea de León Rivera, Antonio Mannino, and Leah Upchurch. The Master and Form is organized by Graham Foundation director Sarah Herda and managing director of public programs Ellen Alderman. Production team: Ava Barrett, Tom Leinberger, Zoe Kauder Nalebuff, Ron Konow, Claire Morton, Alexandra Small, and Rachel Spek.